Alsisar Village, in Jhunjhunu district, is one of the main districts in Shekhawati, Rajasthan. Alsisar is located in the north-western part of the district. The village is surrounded by a semi arid desert. Established in 1440 AD, by a woman named Alsi. The entire town is painted with legendary stories. One of the legend has it that Alsisar and Malsisar get their names from two sisters Alsi and Malsi. They used to walk miles to draw water from a nearby village. Their brother, Nawal Singh had a well dug out. this Sar (water source) is where Alsi settled down and is now called Alsisar. And Malsi in a nearby place called Malsisar. In 1978, Samrath Singh, second out of the five sons settled in Alsisar. He built a fort around it, which still stands today. The entire village street has deserted havelis or mansions, temples with beautiful Frescoed paintings. Shekhawati was part of the Matsya Kingdom, according to ‘Mahabharata’. Legend has it that the Hindu ‘Vedas’ were written in here. Shekhawati Frescoes have its influence from Persia, Jaipur and Mughals. These paintings are all over the walls of Alsisar. Frescoes are mythological illustrations and depictions of either Gods, portraits of everyday life or hunting scenes. As I had book two nights, I paced out my sight seeing of the village with enough time to laze in the palace. I had a trusted guide and we went out in full regal style via my own Jeep tour. Alsisar Mahal has a couple of these unique WWII Jeeps that have been revived and now used as tourist vehicles especially for their customized sunrise and sunset desert safaris. Which is just half kilometer from the palace where get to to sight a good speicies of wildlife around the desert. Drive – The distance from Jaipur to Alsisar Mahal, is about 200 kms, which is roughly 3 hour drive. From Delhi its is about 254 Kms which is about 4 hours drive. Before hitting the Alsisar Village, you arrive at Jhunjhunu one of the main districts in Shekhawati. From here its about 23 kms. There are private taxis or buses that ply by daily. This is one of the main water tanks in the village. The structure is a rectangular shape. It is a water tank or a large sized poo, that once was used by the kings and his family to bathe. These water tanks later were used by the local population during a droughts. These days its just holds stagnant water. The Jhunjhunwala Haveli was one of which I had visited. This exemplifies a traditional and typical example of the Rajasthani architecture. The main features are the tall ceilings and courtyards inside. The walls and pillars have beautiful depictions. The entire architecture of the haveli has a story to tell, via the beautiful fresco paintings. This is one of the largest temples in the village and is a historical site. You can spot this temple from across the village. I ended up on the roof top of the shop opposite to get a good angle shot. Last but not the least is the customized desert safari which is organized by Alsisar Mahal, apart from the heritage walks. I got to ride in one of the WWII restored jeeps, I had to take a picture to show off in. 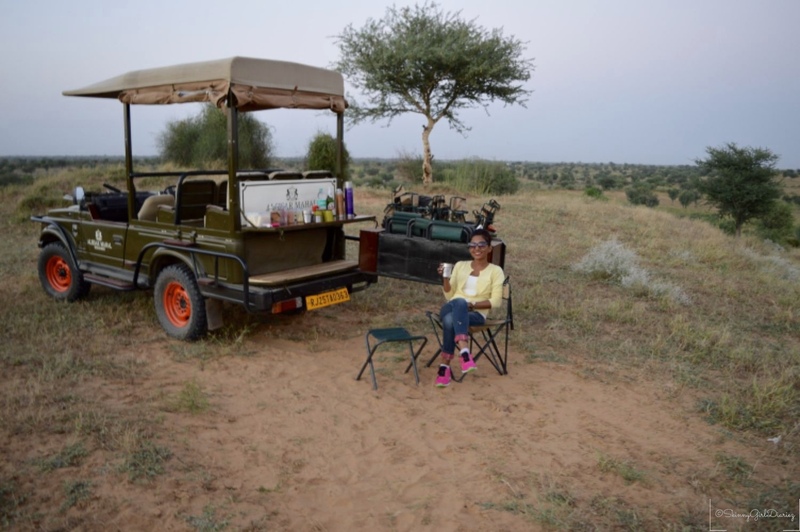 The safari takes you through the village and into an arid desert. You can spot various species of birds and most noticeable are the deer. You get to enjoy the sunset and refreshments are served based on preference. Alsisar Village is a quaint village, and the best part for me was the drive through the rugged desert. The evening you find all the farmers returning back with their cattle. The sunset safari has to be the highlight of my trip. I ended up doing a bit of shopping and got two pairs of juttis (leather ballets). I also ended up stitching a salwar whilst on my tour. This is so useful. Thanks so much for posting! I hope one day I can use this info. Such a wonderful adventure !! Adding this to my bucket list ! It’s looks like you had An amazing trip! I especially love the architecture of the water pump. Great pictures! Beautiful historical buildings! I’ve always wanted to go on a safari – sounds like sunset is the perfect time to go. Hi Deena, glad to hear that your experience in Rajasthan was wonderful. The state has a lot of Laxmi Narayan Temples and you have already seen the architecture around. What other places you’ve been in Rajasthan?